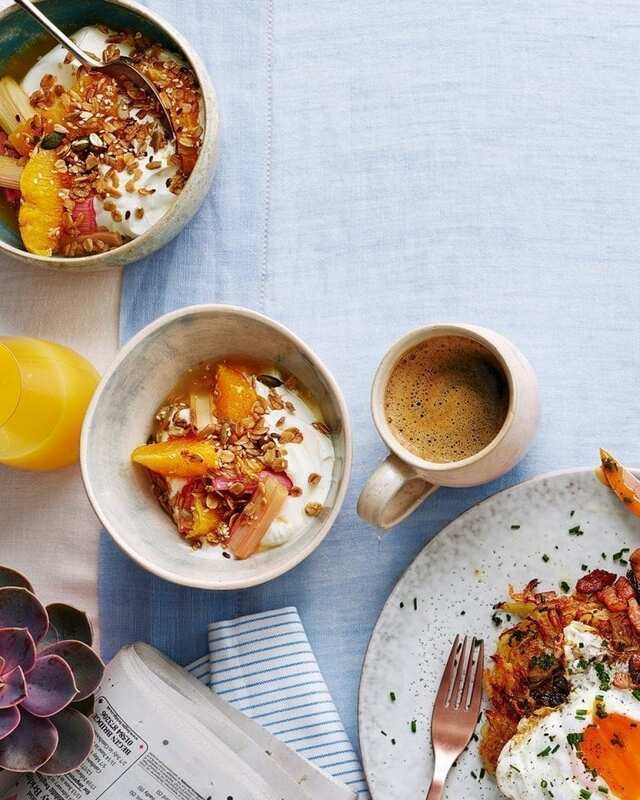 Start the day with sweet roasted rhubarb, orange segments served with creamy Greek yogurt and topped with a toasted oat crumble. Best enjoyed with coffee and a newspaper. Heat the oven to 180°C/160°C fan/gas 4. In a medium mixing bowl, combine the oats, seeds, 2 tbsp of the maple syrup and the oil with a wooden spoon. Spread on a baking tray lined with non-stick baking paper. On a separate roasting tray, mix the fruit, vanilla and remaining 2 tbsp maple syrup. Put both trays in the oven and bake for 15 minutes until the rhubarb is tender but still holding its shape and the crumble is golden and caramelised. Leave to cool, then serve in bowls with a dollop of greek yogurt. The crumble mixture will keep in a sealed container for 2 weeks in a cool place. The rhubarb will keep for up to a week in a sealed container in the fridge.